The Simons Foundation has awarded the Wiki Education Foundation a significant grant in support of the Year of Science. The Simons Foundation’s Education & Outreach initiative “promotes scientific literacy and engagement to help build a society that appreciates the role and importance of scientific inquiry.” The Wikipedia Year of Science will support thousands of college and university students as they improve science topics, including the articles about women scientists. We welcomed Tanya I. Garcia as Director of Programs in November. Tanya will direct the program team, which includes Community Engagement, the Classroom Program, and Educational Partnerships. 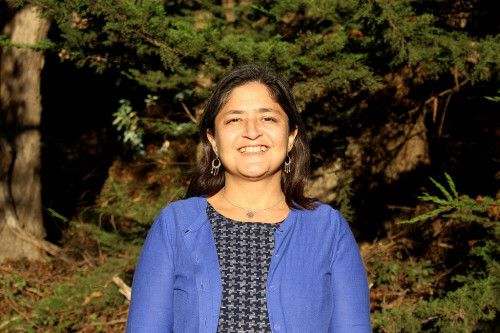 She has nine years of state policy experience, seven years with national organizations, five years of institutional experience, and two years working in the philanthropic sector. Wiki Ed’s new online orientation for instructors is up and running. The instructors module is the first in a completely revamped suite of orientations and trainings for instructors and students, built on feedback from surveys, beta testing, and staff experience. New instructors who have tested the tool have shared their enthusiasm, which is simple to read and navigate thanks in part to the effort of our development team, WINTR. We finalized a partnership with the Linguistic Society of America. Linguistics and language information is ripe for improvement on Wikipedia, where only 12 of nearly 5,000 highest-quality (“Featured”) articles are related to language and linguistics. On November 2, we welcomed Tanya I. Garcia as Director of Programs. Tanya will direct the program team (Community Engagement, Classroom Program, and Educational Partnerships) to achieve high impact while also driving long-term strategic vision of our organization’s programmatic work. Tanya has a deep understanding of the U.S. higher education system. She has nine years of state policy experience, seven years with national organizations, five years of institutional experience, and two years working in the philanthropic sector. She’s served as State Policy Officer for Lumina Foundation, Senior Policy Analyst for the State Higher Education Executive Officers (SHEEO) Association, and Policy Analyst at the New Mexico Higher Education Department (NMHED). Tanya earned a Ph.D. in Public Administration from American University, and a Masters in Higher Education Administration from George Washington University. Her undergraduate work at Florida International University led to a Bachelor of Science in Biology and a Bachelor of Arts in Philosophy. In early November, we finalized a partnership with the Linguistic Society of America. We’re planning a Wikipedia Initiative to spark growth within linguistics departments. Only 12 of the 4,668 highest-quality articles on the English Wikipedia are about language or linguistics. That leaves plenty of opportunities for students and Visiting Scholars to make an impact. 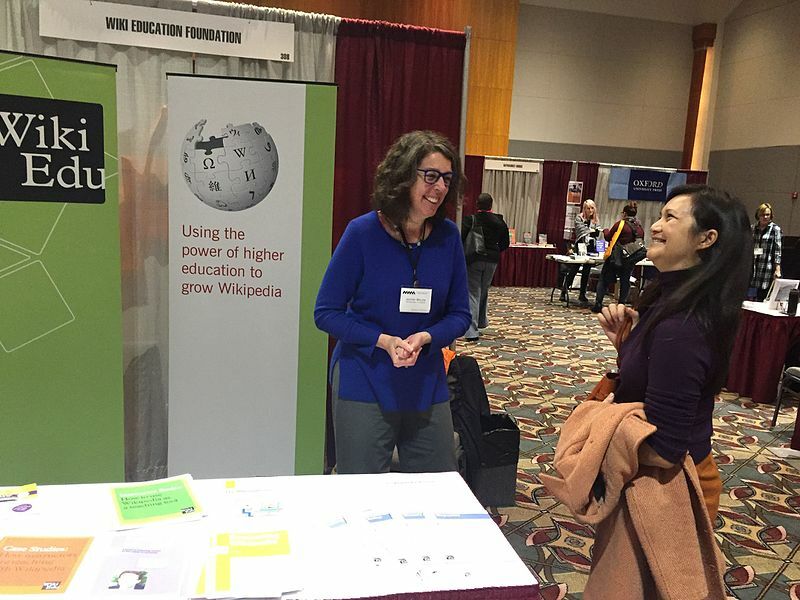 Longtime Wiki Ed participant Jenny Mikulay talks with first time instructor Linh Hua at the Wiki Education Foundation booth at NWSA. Outreach Manager Samantha Erickson attended the National Women’s Studies Association’s (NWSA) conference in Milwaukee, alongside instructor Jenny Mikulay. Samantha discussed Wikipedia assignments with more than 60 instructors and students. Samantha’s workshop focused on improving gender gap content and brainstorming assignments with NWSA instructors. Thanks to Samantha’s outreach, at least six new women’s studies courses are joining the Classroom Program this spring, helping us close Wikipedia’s gender gap. Educational Partnerships Manager Jami Mathewson and Wikipedia Content Expert for Science, Ian Ramjohn, were also on the road. They visited Michigan campuses to recruit instructors for the upcoming Year of Science. The University of Michigan, Grand Valley State University, and Michigan State University hosted presentations. Faculty shared an interest in innovative pedagogy and excitement about the Year of Science. Staff and faculty at all three campuses showed interest in teaching with Wikipedia or hosting a Visiting Scholar. 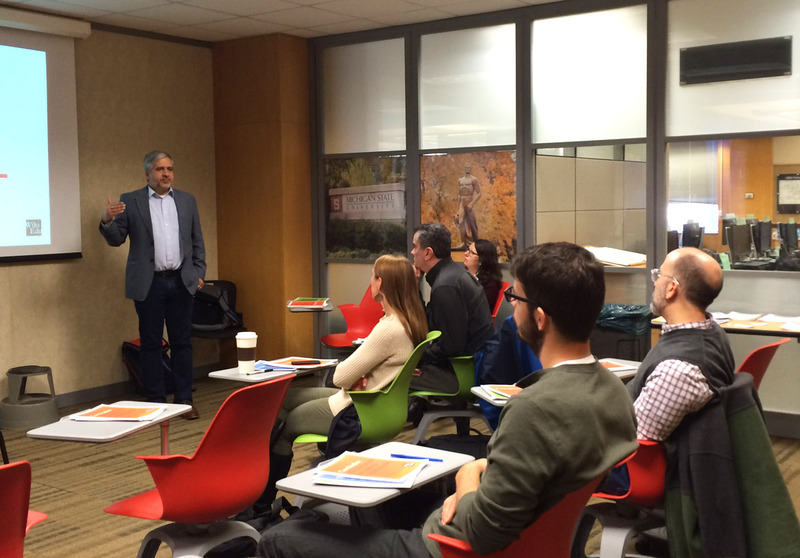 Wiki Education Foundation’s Content Expert in the Sciences, Ian Ramjohn, addresses faculty at Michigan State. Wiki Ed’s outreach effort is now focused on spring classes and Visiting Scholar positions. We’ve reached out to more than 2,000 instructors, librarians, and university staff from past outreach events. We already have eight courses and two additional Visiting Scholars ready for the spring 2016 term, our best-ever position for early recruitment in November. This reflects the value of our Dashboard tool and other infrastructure, which help us prepare instructors well before the term begins. Students edited 3,810 articles and created 319 new entries. The Classroom Program enrolled 160 courses and more than 3,500 students this term. That’s compared to 117 courses and 2,290 students in spring 2015. A variety of tools and strategies are creating a positive experience for students and instructors as they contribute quality work to Wikipedia. Our digital tools play a significant role in our support for such a large number of courses and students. First, our Dashboard tool provides timely feedback to help us keep courses on track. Second, ask.wikiedu.org frees up staff time by directing instructors and students to our database of questions. The Dashboard also tracks student training. That’s made a significant impact on the number of students completing that online training. This term, roughly 3/4 of our students are up to date in their training, compared to half in spring 2015. This means that more students are set up for success before they begin editing. These digital tools help Classroom Program Manager Helaine Blumenthal, and our Wikipedia Content Experts, Adam Hyland and Ian Ramjohn, better direct their support. Helaine keeps in contact with instructors throughout the term to head off any concerns. With the Dashboard, Ian and Adam provide students with feedback when they need it most. All of this means that growth and support can go hand in hand. We’re feeling confident about the Spring 2016 term. We trust that our tools, including new student and instructor trainings and Dashboard improvements, will extend our impact. Chelsea Blackburn Cohen, from Tanushree Rawat’s Introduction to Doctoral Inquiry at the University of Wisconsin, produced a great expansion to the article on international branch campuses. The article had been tagged for improvement since 2011. Chelsea rewrote the article entirely, offering a historical background and overview of their use around the globe. Regina Olson Hughes was a prolific American botanical illustrator during the 20th century. Notably, Hughes is the only person to have both a plant species and genus named for them, a fact which Wikipedia readers would never have learned before User:Cpw2054, from Tamar Caroll’s American Women’s History course, thoroughly expanded the article. Ariella Rotramel’s course in Advanced Readings in Feminist Theory has created four articles, and expanded many more, on both the academic and activist sides of feminism. Contributions include a collaboration between two students. In September, User:TinaFeyminist created a new stub on Audre Lorde’s collection of essays, Sister Outsider. This month, User:Ekenah expanded that article, summarizing its impact on the literature of intersectional feminism. On Wikipedia, collaboration doesn’t have to occur simultaneously, and together, both students created a great resource. At the University of Maryland, Janna Bianchini’s Women in Medieval Culture and Society course also created four articles in their subject area and made large expansions to Wikipedia’s existing article on women in the Middle Ages. Students summarized the history and historiography on their subjects, creating articles such as marital debt, medieval singlewomen, andMedieval women mysticism. Each of these articles references scholarly work on the period, providing a great jumping-off point for scholars and editors looking to improve the articles. Another new article, Youth in Guatemala, created by User:MHDU for Drake University’s Global Youth Studies, covers demographics, education, poverty, and health in a clear, well-cited article. Tamar Caroll’s American Women’s History course has created or expanded several articles on women in history. Laura Horak’s course on Cinema and Gender, mentioned in last month’s reports, continues to expand on their work and add to new articles. One of the features of modern molecular biology is a vast reduction in the cost of data collection, such as the ease of screening samples. A student in Northeastern University’s Advance Writing for the Sciences class created a new article on CD/DVD based immunoassay, a technique that uses CDs, DVDs ,and Blu-ray discs as a low-cost tool to evaluate toxins, DNA, antibodies, disease biomarkers, and microorganisms. The student editor added sections discussing the underlying principle of the technique, applications, hardware to read the discs, and ways to improve their results, in addition to comparing the technique with other tools. Nicks are breaks in one of the two strands of a DNA molecule that play a role in DNA replication and repair. A student in the University of Michigan’s Nucleic Acid Biochemistry class added 2,000 words to the Nick (DNA) article, expanding it from a single paragraph into a substantial article with four major sections. The student added a section about the formation of nicks, and another about how cells repair nicks. Additional sections were added about the biological implication of nicks: they play a role in DNA replication and transcription, and in the repair of DNA damage. The student also added two images. Amino acid molecules consist of hydrophilic segments that are attracted to water, and hydrophobic ones that are repelled by water. In a water-based medium, like the cell, newly formed proteins configure themselves so that the hydrophilic regions aggregate together. Hydrophobic collapse is a model that explains how this process occurs. A student in the UCLA class Chem 153 Honorsexpanded that article by 1,300 words, adding sections on the biological significance of the process, the energetics of it, and the formation of surface structures around the hydrophobic region that contain both hydrophobic and hydrophilic properties. They also added three diagrams to help readers visualize some of those processes. The Wikipedia Visiting Scholars continued to produce high-quality work in November. Casey Monaghan (User:Seattle), sponsored by the University of Pittsburgh, created an article about Robert Schmertz (artist) (1898–1975), a Pittsburgh-based architect and folk musician. That article was successfully improved to Good Article quality. Meanwhile, an article about the Norse-American medalthat George Mason University Visiting Scholar Gary Greenbaum (User:Wehwalt) has been working on since September became a Featured Article. Scholars have also been using images from the universities’ digital collections, which they’ve shared on Wikimedia Commons. Casey has uploaded images of Pittsburgh mayors from Pitt’s collection, adding them to appropriate Wikipedia articles. Community Engagement Manager Ryan McGrady has been working with Samantha to recruit new sponsoring institutions. Together, they’re taking prospective sponsors through the onboarding process, and creating a new internal tool to manage that process. On the program’s Wikipedia page, you can find profiles of past and current Scholars and sponsoring institutions. For example, here is the page for the University of Pittsburgh, with profiles of its two current Visiting Scholars: Wikipedia:Visiting Scholars/Participating institutions/University of Pittsburgh. The chemistry and species brochures from the Wiki Education Foundation. Communications Manager Eryk Salvaggio published two new guides for student editors. 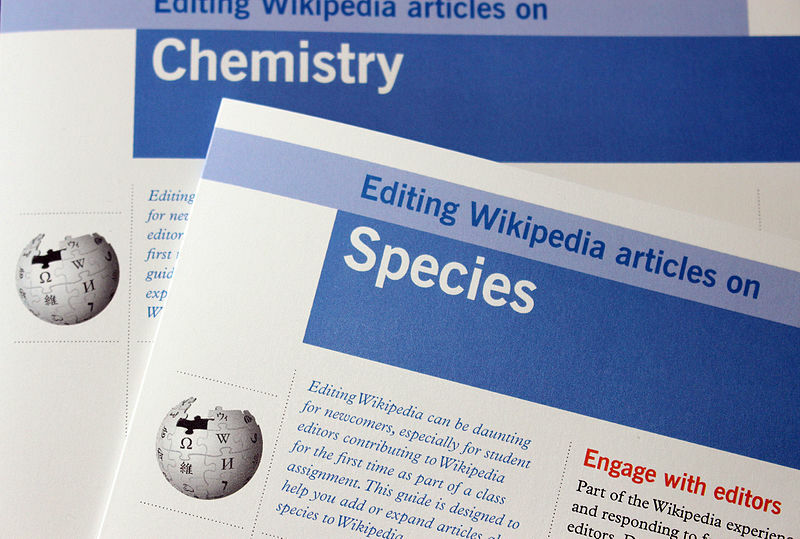 “Editing Wikipedia articles on Chemistry” and “Editing Wikipedia articles on Species.” These guides are intended to assist student editors writing articles as part of the Wikipedia Year of Science initiative, which aims to enroll an increased number of science courses in 2016. The “Chemistry” guide will encourage high-quality edits in chemistry topics such as chemical and chemical compound articles, and infoboxes related to each. The “Species” guide shares common structures for plant, fungus, and animal articles, and how to create a specific “Taxobox” with species information. Both were written with input from Ian and various community members and WikiProjects. Dr. Ye Li, of the University of Michigan, was especially helpful in reviewing the Chemistry guide. “The most fascinating Wikipedia articles you haven’t read,” Washington Post (November 5). To celebrate the 5 millionth article on Wikipedia, Eryk shared a student article on Susan LaFlesche Picotte. Our software development efforts this month have focused on the experience of new users. Product Manager Sage Ross and the designers and developers at WINTR have been working on building the skeleton of a new Dashboard training module system. Sage and Eryk fleshed out this new system with a New Instructor Orientation module. In mid-November, the module went live on our testing server. We started user tests with instructors who will be teaching with Wikipedia for the first time this spring. Those tests helped us refine the content, and confirmed that the technical design is solid. The training system is now live on the dashboard, and we’ll continue expanding and improving the training content through December. We’ve been exorcising many of the technical ghosts that once haunted the Dashboard. Many of the bugs that frustrated instructors during our first term of dashboard-based courses have been chased off. Now, we’re hard at work on a redesign of the Timeline editing experience. Wiki Education Foundation monthly expenses for November 2015. For the month of November, we received additional funding from the Stanton Foundation ($771k) and contributions from individuals ($10k). 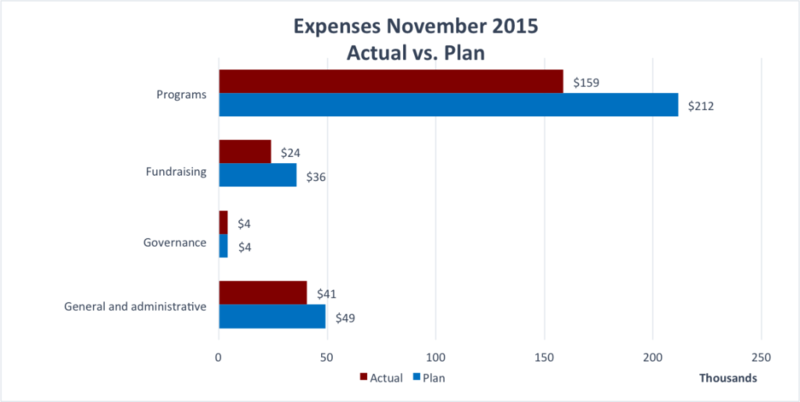 Expenses were $227,307 versus the plan of $300,731. The main cause for the $73k variance was the previous decision to hold off on additional office space and staffing until we had a better handle on long-term funding. Wiki Education Foundation Year to Date expenses for November 2015. 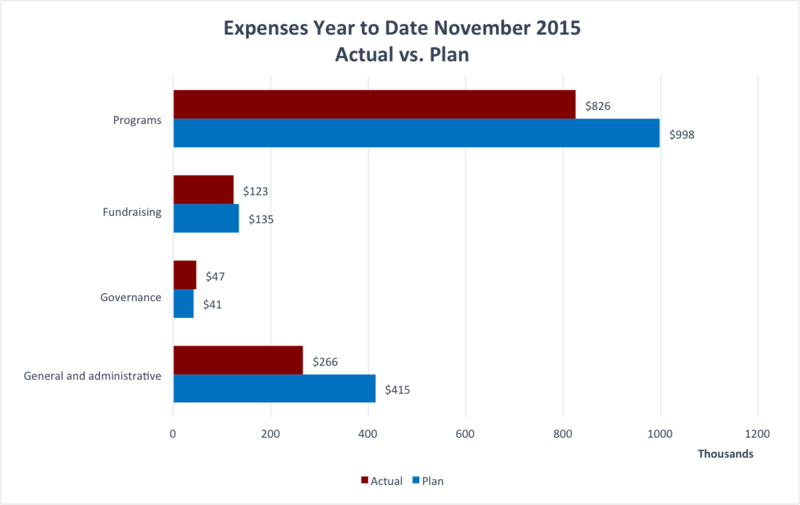 Year-To-Date expenses are $1,262,858 versus the plan of $1,588,983. Timing of certain expenses (staff development: $15k and staff travel and conferences: $21k). The Simons Foundation has awarded the Wiki Education Foundation a significant grant in support of the Year of Science. The Simons Foundation’s Education & Outreach initiative “promotes scientific literacy and engagement to help build a society that appreciates the role and importance of scientific inquiry.” Thanks in part to the support of the Simons Foundation, the Year of Science will deepen science communication skills among thousands of university students, increase visual representation of science topics in Wikipedia’s image repository, improve the coverage of women scientists, and enhance the visibility for the Year of Science with to-be-announced media and online engagement tools. Learn more about the Simons Foundation’s work, here: https://www.simonsfoundation.org/. In early November, Wiki Ed conducted our second external fundraising event at New York University’s Torch Club. The event was co-hosted by Lorraine Hariton, Wiki Ed Board Member, and Martha Kanter, former U.S. Under Secretary of Education. More than two dozen people attended, including Wiki Ed Instructor and CUNY Brooklyn College professor Amy Hughes, who spoke about the benefits of teaching with Wikipedia. The development team is working closely with the Wiki Education Foundation Board of Directors on a year-end giving campaign that includes a matching component. We added a secure online donation platform to the Wiki Education Foundation website here: http://wikiedu.org/donate. In November, Executive Director Frank Schulenburg joined Senior Manager of Development Tom Porter on a fundraising trip to New York. Besides speaking at our second external fundraising event at the NYU’s Torch Club, Tom and Frank met with staff of the New York Academy of Sciences to discuss opportunities for future collaboration. In particular, they discussed the opportunity of bringing leaders of academic and science-related organizations together in order to make academic engagement on Wikipedia sustainable beyond the Wikipedia Year of Science in 2016. Frank created a guide for director-level positions for handling compensation settings for new positions, promotions and salary increases, in ways that ensure consistency across the organization now that the senior leadership team has grown to five people. Executive Assistant to the ED Renée LeVesque and Frank began planning for in-person meetings taking place in January and February 2016. Wiki Ed will host a board meeting at the end of January, a senior leadership meeting in mid-February, and an all-staff meeting at the end of February.